I found this book at a garage sale some time back and thought the title was cute. The story is about a boy who is convinced that every night, after his mom puts him to sleep, he has bears in his bed. He tries to think of ways to encourage the bears to leave him alone. Perhaps he could lead them to a zoo with a trail of honey? Perhaps they could go on a car ride to someplace far away? Finally, he succeeds in ridding himself of these annoying, pesky bears and ends up with an elephant in his bed the next night! This book is cute. Despite its premise (of having unwanted bears in your bed) it is not scary at all. 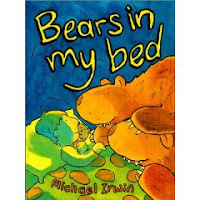 The story deals with the imagination of a boy who is dealing with a nuisance and the bears are not portrayed in any negative light (other than just being a bother by taking up too much bed space and drooling). I would say that this book is excellent for ages 1-4, especially. Little did I know (when I purchased this book before my son could focus on a book, let alone enjoy the story contained therein) that I was predicting the future. My son has his own bears that share his bed space. The difference is, he requests their company and is in no hurry for them to go anywhere, anytime soon! From L to R: meet Pooh Bear, Black Bear, Panda Bear, Blue Bear. Wherever he goes, they go. My son also shares the pillow with bears -- mostly of the polar variety, although they don't stay very white. Um, I meant they get dirty because he takes them outside, not because of anything in the bed... just wanted to clear that up.